It’s not too often you hear the words healthy chocolate slice in one sentence… especially not when that’s a chocolate rice bubble slice recipe, but guess what! It’s here and it’s amazing! Back at the start of the school year I was doing a bit of experimenting. My kids LOVE chocolate crackles, so was it possible to make healthy chocolate crackles instead? Yeah it is, however I decided even quicker than that would be converting it into healthy chocolate crackle slice instead! Not only does it taste amazing, it uses healthy ingredients, so you can feel like a total BOSS when you serve it up for your kids! Or sneak half a tray worth yourself when no one else is looking! It’s that good! Grind up your sunflower seeds in a food processor until fine. Add Rice Bubbles, sunflower seeds and raw cacao powder to a large mixing bowl. Add coconut oil and honey and mix your ingredients together well. Prepare a slice tray by lining with baking paper. I used a medium sized rectangular tray. Spoon mixture into tray and press down really firmly into the bottom of the tray. Use another dish or similar to press down or use a glass to roll. You need to put a bit of muscle into this step. Place in fridge and leave to set. This will take around 3 hours. Once set, cut slice into squares and store in an airtight container in the fridge. 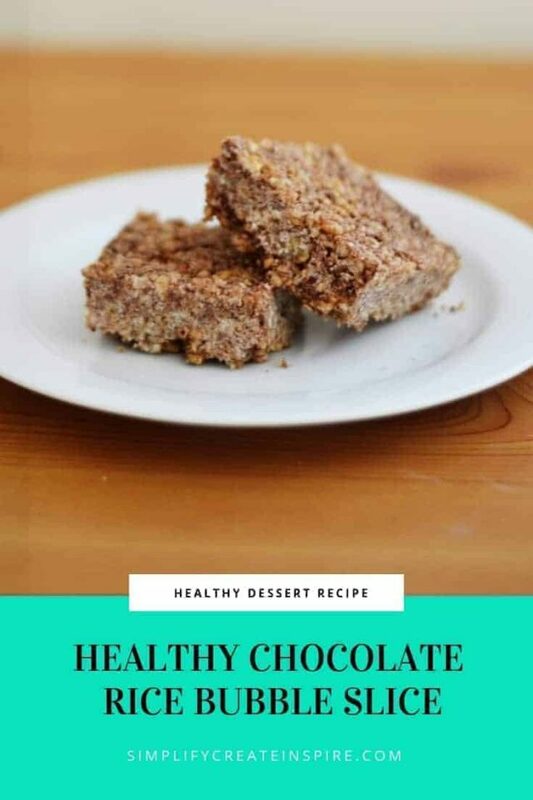 This healthy chocolate rice bubble slice needs to stay chilled or it may crumble so it isn’t a great option for school lunches, however it is perfect for after school snacks or curbing the sweet tooth. We keep ours in the fridge and just grab a single slice for a healthy treat as needed. Although if you are looking for great school lunch recipes, I have loads of delicious lunch box recipes here. For a not so healthy alternative, these white chocolate crackles are AMAZING!! !